When it comes to baroque music I have always been something of a Francophile, with the infinite variety of musical styles on offer supplying something new at every turn. This CD presents a selection of Airs de Cour, or courtly songs, mainly by Charpentier — yes, he of the Eurovision fanfare — along with a couple by Lambert and one by Morel. This is a well planned and executed programme, with the airs interspersed with movements from François Couperin’s instrumental masterpiece Les Nations. These courtly airs are seldom recorded so a programme as fine as this should be snapped up as quickly as possible. 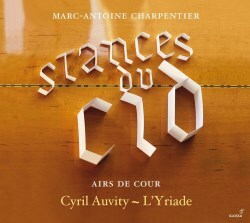 The disc takes its title from three short airs composed by Charpentier and based upon Rodrigue’s first three stanzas in Act I, scene VI of Le Cid. They were published separately at the beginning of 1681 in the Mercure Galant. Catherine Cessac, in her wonderful book on this composer, suggests that these three pieces for haute-contre and continuo were probably written for Charpentier himself to perform (p.322). The music follows the meter of the text well. Cessac goes on to state that it is “appropriate for expressing ‘irresolution and anxiety.’” This aspect of the text is here wonderfully emphasised by Cyril Auvity. His clear haute-contre is more able to exemplify the fragility of the situation than that of Paul Agnew for William Christie on Erato (0630-14774-2). Although Agnew sings the pieces well, he sounds a little too heroic. Of the other airs, many of which are little gems, Non, non je ne l’aime plus is probably the best known. Again Christie has recorded this on a separate disc for Erato where he employs a number of soloists (3984-25485-2). Although Christie’s version is only slightly longer than the account found on this new disc, it comes across as laboured in comparison, with Auvity’s version sounding crisper. There are a few other airs which feature on both discs and I must say that the Christie comes off second best in all cases. This is especially the case in Auprès du feu l’on fait l’amour where he uses the bass of Alan Ewing and the baritone of David Le Monnier. They come over as amorous medieval monks rather than as ardent young lovers. I only knew one of the Lambert airs and the Morel was new to me. They are more than make-weights and add valuably to the whole programme. This is a desirable disc - one in which Auvity’s distinctive haute-contre amply conveys the emotions of these varied and beautiful airs. L’Yriade are excellent in their accompaniment. They sound lighter and more apt in Le Cid than Christie's forces despite his employing a smaller ensemble. Their playing of Les Nations is nicely tempered to complement the rest of the programme. The sound is beautifully captured and well balanced. As for the accompanying booklet notes they are admirable. They come with full texts and translations, as well as an explanation of haute-contre, or high tenor, and its place in the music of the 'ancien régime'. Glossa should be applauded for this release.